Ashraf `Ali Thanvi narrated regarding Aala hadhrat (makki) Sahab that one day Aala Hadhrat saw a dream that his brother’s wife was cooking food for his guests. Meanwhile the Prophet (Sallallahu Alyahi Wasallam) comes and says (to her): get up and go, you’re not eligible to cook for Imdaadullah’s guests. His guests are (respected) scholars for whom I shall cook. Ikhwaan, if this is not blasphemy I don’t know what is. The reason I avoid commenting on posts is; lest I harm the deobandhi reader by my anger. The deobandhis venerate such a person!! 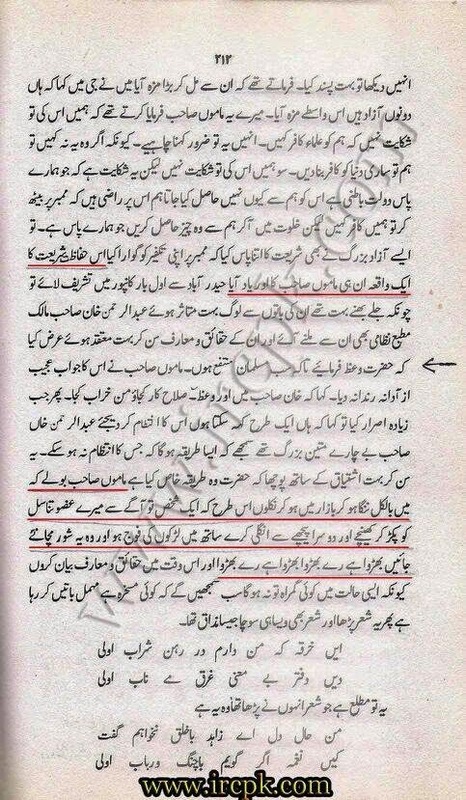 we understand why the institutes do it in India in this era with this current day concept of social cohesion and this neo-con agenda in globalisation etc etc and some of our Ahlul Hadeeth have fallen into this badly and it is INCORRECT and may Allaah rectify their affairs Ameen, but what problems were there in 1980 when Qari Tayyab, the rector of Dar al-Uloom Deoband had to invite the Mushrikah Indira Gandhi to their Deobandi Madrassah for their 100 anniversary. 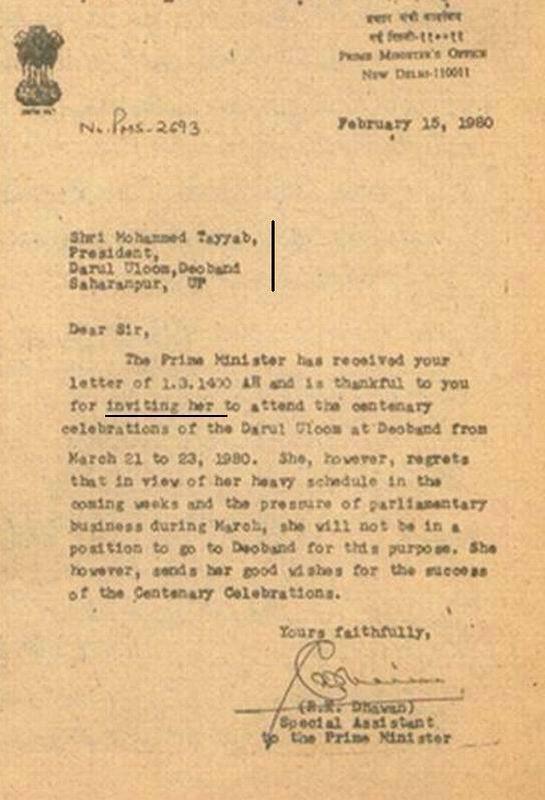 Although she never went, she did however go at a later invitation. So here seeking waseelah through the dead has been established for Imdaadullah Makki. So this is the affair of Imdaadullah Muhajir, clearly his beliefs are contrary to the fundamental teachings of Islam. This is not one mistake that can be over looked but there are many and as we mentioned. A dear brother by the name Hussain/Khurram left a comment which clearly showed he was angry or upset. You mentioned some points which were very trivial and as we highlighted in the previous part it was a case of just showing the mindset and thinking. For example in the year 2001 and some years after that a whole conference was organised in india in Refuting the Ahlul Hadeeth and all sorts of false allegations. The same conference was organised and replicated in England Birmingham under the banner of “Tahafuz-e-Sunnat” ie a conference in preserving the Sunnah when yet the whole conference was about ridiculing the Scholars of Ahlus Sunnah and the Sunnah, the Ahlul Hadeeth and the good righteous scholars like Shaikh Abdul Azeez ibn Baaz and Shaikh Muhammad Naasir ud deen al-Albaanee. At the same time numerous hate fuelled books and treatises were given out free. We never got angry or annoyed nor did we have a huff and a puff. The reality is sometimes we have to approach these issues with an open mind. Rather then getting upset all of us should seek clarity and help the muslims in ridding our community of these bad and corrupt beliefs so that our future generations can be free of any false beliefs which may lead them astry as opposed to us just getting all angry and wound up. This is our deen something we have to die upon so we dont take these issues lightly. The point being we should free ourselves from bigotry and partisanship open our minds and research the truth without blindly following personalities and eloquent speakers. Insulting remarks will not benefit yourself nor us. Lastly we wish good for you and all the Muslims. We hope people see that the aqeedah of Imdaadullah Makki was not the basic Sunni Aqeedah and hence clarifications are necessary more so for those who profess love and promote Imdaadullah Makki. This belief entails that Allaah is in everything that exists eg trees, stones, animals and humans ie meaning that everything that exists Allaah is in it. There are varying understandings of this belief but the most common understanding is that the creation is a physical manifestation of Allaah and unfortunately the Deobandee school of thought is also riddled with this belief. This polytheistic concept is also rampant amongst the Soofee, Bareilwees and many muslim groups and sects. The irony of this is Imdaadullah Muhajir Makki was a strong proponent and propagator of this belief to his students specifically and to the general masses generally. This is why you find the same stench of this corrupt belief amongst the Deobandee Elder Shaikhs. This statement has never been denied but rather accepted by the later Scholars of Deoband not only this but they also propagated this belief further and taught it throughout their various madrassahs and institutes for example in Dar al-Uloom Deoband, in Saharanpoor, Dhabel in India and in all of the other major institutes around the subcontinent including Pakistan, Bangladesh, Afghanistan, Burma and Sri lanka. This statement also further shows some of the early major Deobandee scholars also believed in Wahdatul Wajood because their teacher affirmed it for them. Here Imdaadullah Muhajir Makki is saying that man is in reality a manifestation of Allaah in human form which is the belief of wahdatul wajood. Imdaadullahs beliefs again show he believed Allaah was on this earth in Human form disguising himself. Sometimes this anti Islamic belief is explained further that a part of Allaah is in everything, meaning Allaah took a part of himself and he created everything that exists. This form of meditation is what a common day soofee does ie continuously reciting some words of the Quraan so much so that he loses his senses and reaches a state of oblivion known as Fana which means extinction or annihilation of the self with Allaah, but when he loses his senses he physically remains alive. Fana is a pure soofee term and its concept is taken and found in other religions. Fana can only be achieved by engrossing yourself and this is exactly what Imdaadullah Muhajir asks everyone to do. When these soofee enter this state they have no existence outside of the unity with Allah. These misguided soofees from the deobandees and barailwees have taken this from other misguided religions. Fanaa is equivalent to the concept of nirvana in Buddhism,or moksha in Hinduism which also aims for annihilation of the self. A prime current day example of this are the whirling dervishes or the Dhikr some soofees do in unison saying Haq-Allaah and slowly by slowing this Haq (truth) becomes one with Allaah and hence the state of Fana. In Syria, Turkey, Jordan, Morocco and Egypt aswell as many other countries special gatherings are organized just to meditate and to perform dhikr loudly aswell as other means to achieve this fana. In some countries especially in the Indian sub continent music is used to aid this unison or fana. So at shrines and tombs you often have musicians playing instruments and the public dancing without any segregation with abundant free mixing all based on evilness, with the opposite sexes heavily mixing and touching, all in the presence of these learned people from Allamah this to Shah that. A single word of disapproval is not uttered from them and all in the name of soofee fana and unsion with Allaah. They organise dances with drums and bells and music known as Qawaalian. Sometimes you find the men with bells around their ankles and they dance, sometimes young boys or girls are made to dance. They believe the constant sound of the music will help them better and assist them in achieving the state of Fana. Some of the soofees believe because Allaah is already in them based on the aqeedah of Wahdatul Wajood it is a lot easier for them to achieve fana with Allaah. When this happens they appear to be in vegetative state helpless as if they are in a coma. The people around them begin to respect and revere them thinking they have reached a high status as they have achieved communion with Allaah and then they become known as Holy saints or Peers. All of these concepts lead to what we have in our society and community from holy saints, peers, mureeds, shamans and so on. This is the reality and the core idea and basic principle of the deobandee scholars and especially their founding father, Imdaadullah Makki. When the soofees reprimand the other soofees who allow the usage of music, and free mixing and all of the other sins, its just a case of, the better of them reprimanding the worse amongst them just because they don’t use music or dance and rather use pure words from the Quraan. This does not change anything, the concept, idea and end goals remains the same but just the means of getting to the end change. So he says the aforementione verses are other words of the Quraan that can also be used for meditation to achieve fana and this is evident from the usage of the type of verses. These statement of Wahdatul Wajood and the mixing of the creation with the creator propagate shirk and indicate similarities to the beliefs of other false religions. The Hindus, Buddhists as well as other religions all believe similar concepts regarding the supreme creator. As muslims we should warns against such beliefs and aid the Muslims with good correct sound beliefs which the pious predecessors understood and explained to the people. These 2 statements of Imdaadullah Makki show how he asked the Messenger of Allaah (Sallallahu alayhee Wasallam) for help and to remove his difficulties and how he held it was permissible to go to the graves of his teachers and benefit from them. It is apparent he must have only benefitted from them as he would in their lifetime by asking them for help. The statement of Yaa Muhammad we plea to you is sufficient to elucidate a shirkee concept.